Full disclosure: This is only my 2nd experience with migrating a data center and the first time I was working with a much smaller network and infrastructure in general with a stacked pair of 3750s using static routes, some L2 2960s and a couple of ASA 5510s. This last experience is what I’ll be writing about. But first, let me give you some background on the data center before we moved. Our core was a pair of 6509s using VSS with a pair of stacked 3750s at the top of each server rack. We used 2x10G links in an etherchannel from the 6500s to each stack of 3750s which was plenty of bandwidth for our traffic in my opinion. I don’t have any graphs or performance monitoring to back that up, so I’m going off of my own mileage. We have just migrated from Cisco Works to Cisco Prime but with all the projects right now, we don’t have the time to truly see the power of Prime and if it can do what we need it to do. Also, other networking equipment exists, however they were not changed during the move so I will not comment on them. NTP on the 7K can only be configured from the default VDC. This is an issue for us because we do not control the default VDC so we’ll have to eventually configure connectivity between the 2 VDCs in order to pull time from our hardware time appliance. From Cisco’s site, “You must configure NTP in the default VDC.”. 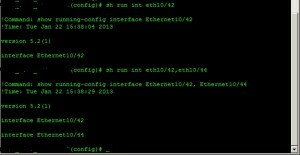 Network statements inside the router process for EIGRP and OSPF are not supported and you advertise the network by placing a command on the L3 interface (e.g. ip router eigrp 1). Passive-interfaces are also configured inside the interfaces. No more unicast neighbor statements with EIGRP or OSPF. I know this shouldn’t be needed in most circumstances, however we manage a network with hardware encryption devices that don’t pass multicast packets; our work around for this was using the neighbor statements for each expected neighbor. Since we could no longer rely on this, we had 2 options. Use GRE tunnels or put a Catalyst device that supported this command in front of the 7K. Since we found out about this so late in the process, we went with the latter and put 2911 routers in front of the 7K to avoid having to re-engineer our network on the fly. No more need for the ‘do’ command when trying to perform show commands from global config mode or another specific configuration mode. That’s right, just like the Cisco ASA’s OS for those of you familiar with it, you can run the commands from anywhere. Also, if you run a command that isn’t found in that level of configuration, the OS will attempt to find a match command in levels below it and if found, apply it there. In IOS, AAA can be configured using the TACACS+ protocol where you can use the default group “TACACS+” when you want to use all of the specified TACACS+ servers. In NX-OS, you must create the group first and specify the servers inside of the group before you are allowed to use them. There are definitely more differences out there but I won’t cover them all here. If you have run into any good ones, feel free to share. I will give my impressions of the Nexus gear and overall experience in part 2 of this post. Stay tuned and thanks for reading! This entry was posted in Uncategorized, Work related on January 23, 2013 by Keith Miller.